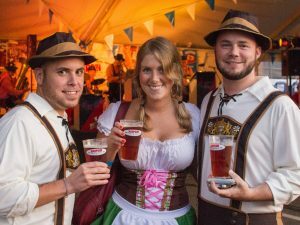 Wine-tasting featuring local Maryland vineyards and retailers, a traditional Beer Garden, food vendors and German entertainment. A cappella performance groups, artists and crafters, free horse-drawn wagon rides, apple cider pressing, traditional Oktoberfest crafts for children, and nonprofit vendors. Along Main Street, there are four more stages of entertainment featuring variety bands and community groups, an extended business expo, strolling entertainers, mini golf, children’s crafts, inflatables, and plenty of restaurants and retail establishments to explore. Noon to 5 PM. Admission and parking are free. Satellite parking at 200 Orchard Ridge Drive, just off of Quince Orchard Road.